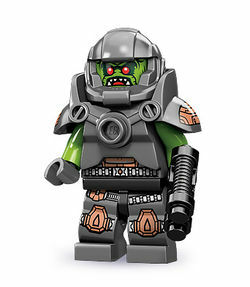 Alien Avenger is a Minifigures Series 9 minifigure released in January 2013. He will also appear in LEGO Minifigures Online. The Alien Avenger has a silver helmet and a green head with an angry expresion, red eyes and white teeth. He has silver body amour and torso. His torso has a big body vest on it with the word Shami written on it, and he has green arms and grey hands. His legs are dark grey and have knee pads on them. He has the same armor and helmet pieces as Galaxy Patrol, but in grey. He also has the same gun. His uniform has the name Shami printed on it. He is the third named minifigure in the Minifigures theme. The first one was the Mechanic and the second one was Galaxy Patrol. His name may be a reference to 6975 Alien Avenger. The Alien Avenger is part of a team of rough, tough space warriors assembled from all across the galaxy. With armor and weapons scavenged from the battlefields of a hundred war-torn worlds, he may lack military discipline, but he makes up for it with brute strength and eagerness to charge into battle no matter the odds. As one of 5,000 identical siblings, the Alien Avenger is used to not standing out in a crowd. But it doesn’t bother him that some may see him as just another nameless, faceless trooper – give him a planetoid beneath his feet and a disintegrator blaster in his hand, and he’ll take on anything and everything that comes his way!"